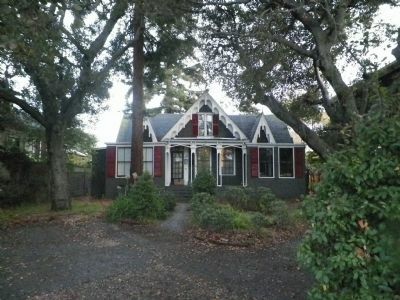 This home built in 1854 for John Nelson Webster and Caroline Webster is Alameda’s oldest house. The house is a primary example of Gothic Revival architecture by renowned architect Andrew Jackson Downing. The house was prefabricated in New York, shipped around Cape Horn in the hull of the bark Henry Harbeck and assembled in 1854. The interior walls are solid redwood with some planks being 22” wide. The redwood came from Leona Heights, the redwood forest to the north of Alameda. Fires in the late 1800’s and 1920s damaged the rear of the home. The home was acquired by Andrew and Susan McCormack on February 5, 1984. They replaced the damaged areas and proceeded to restore the home and convert its use from a single family home to a bed and breakfast inn. 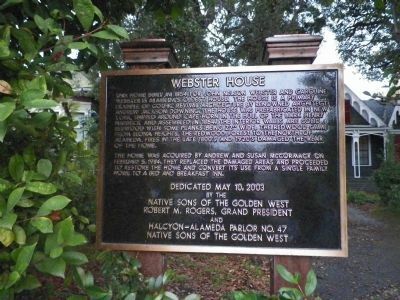 Erected 2003 by Native Sons of the Golden West, Robert M. Rogers, Grand President and Halcyon-Alameda Parlor #47 NSGW. W. Marker is in Alameda, California, in Alameda County. Marker is on Versailles Avenue, on the left when traveling south. Touch for map. This marker location is three doors south of Encinal Avenue. Marker is at or near this postal address: 1238 Versailles Avenue, Alameda CA 94501, United States of America. Touch for directions. Other nearby markers. At least 8 other markers are within walking distance of this marker. Clark Memorial Bench (approx. 0.4 miles away); Prehistoric Indian Mound (approx. 0.4 miles away); Alameda’s First Church (approx. half a mile away); Alameda City Hall (approx. 0.6 miles away); Alameda City Hall, 1895-96 (approx. 0.6 miles away); Historic Alameda High School (approx. 0.6 miles away); Alameda Lodge No. 1015 (approx. 0.6 miles away); Meyers House (approx. 0.9 miles away). Touch for a list and map of all markers in Alameda. More. Search the internet for Webster House. Credits. This page was last revised on June 16, 2016. This page originally submitted on November 15, 2014, by James King of San Miguel, California. This page has been viewed 365 times since then and 10 times this year. Photos: 1, 2. submitted on November 15, 2014, by James King of San Miguel, California. • Syd Whittle was the editor who published this page.